I was raised in the city, and until recently had never even seen a Bluebird. In 1992 we moved to the country, where beautiful birds were plentiful. We installed feeders and birdbaths, and discovered the joys of watching Goldfinches, Cardinals, House Finches, Juncos, Starlings, Cowbirds, Red-Winged Blackbirds, Chickadees, Titmice — in short, every kind of bird you can imagine — but no Bluebirds. Oh, I think once I had spotted one perching on a fencepost in the yard for about three seconds before he flew off, but that was the full extent of my contact with them. 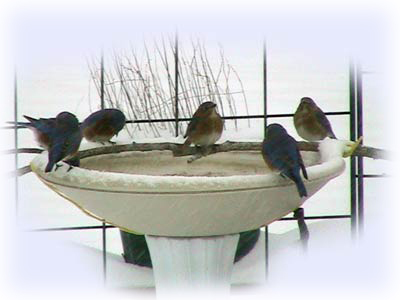 Then in the fall of 2000, I decided to install a heated birdbath in my little bird feeding sanctuary. “Heated” is a rather misleading term, since there is nothing even remotely warm about the water in a heated birdbath. This is not a birdie hot-tub we’re talking about here. But it does keep the water from freezing solid, and allows the birds to drink, and to bathe when the temperatures allow it. Birds actually stay warmer if they bathe in the winter whenever possible, because a clean feather is a better insulator than a dirty feather. Anyway, one morning in mid-winter I looked out the kitchen window and couldn’t believe my eyes! There were about a dozen birds sitting in a ring around the birdbath. I blinked, rubbed my eyes, ran to get my glasses and looked again, and there they were, Bluebirds! During the following weeks, I spotted them there a few more times. That spring, I bought a “Bluebird House” and mounted it (I shudder to think of it now) in a tree! Sadly, I didn’t see any Bluebirds that spring/summer. A House Wren couple inhabited the nestbox that year. During the winter of 2001-2002, a friend of mine gave me two more nestboxes that he had made, and in the spring I mounted both of those — again, in trees. That spring we did have a Bluebird couple visit and decide to make our yard their home. When I eventually did some research on Bluebirds, I was horrified to find that my efforts to help the birds might actually have endangered them. My interest in observing and photographing these beautiful little birds led to the creation of this website and eventually to opening the Bluebird Nut Cafe, our free discussion forum. With the help of some members of the bluebird community, I created a flyer for bluebird enthusiasts to use in spreading the word about bluebird conservation in their neighborhoods and made it available as a free download on both websites. The message board still draws many visitors each nesting season, and my moderators and I pride ourselves on making the forum a very friendly, welcoming place for both newcomers and seasoned bluebird veterans. Since 2002 I’ve had the privilege of hosting, not only bluebirds, but also tree swallows in my backyard “trail”, and in 2012 I also had a successful Chickadee nesting which produced seven beautiful baby chickadees. In 2004, the Bluebird Gift Shop conducted a special campaign called “Help the Hurricane-Homeless Blues”. BluebirdNut produced a beautiful 2005 Bluebird Wall Calendar, the proceeds from which were donated to help rebuild Bluebird Trails in the Gulf Coast area of Florida. Thank to all who so generously participated in this campaign. One of my most interesting projects was the quest to come up with a new design for a mealworm feeder. That story is told on my Bluebird Nut Feeder page. For the past few years, I’ve been Cayuga County Coordinator for the NYSBS (New York State Bluebird Society). During that time I’veassisted in re-creating and updating many of the free handouts used by the Society, and in 2010 I took on the job of layout artist for “Bluebird News“, the NYSBS’s quarterly newsletter. I enjoy putting an attractive face on the excellent content provided by Judy Derry and all the contributors. At the fall 2012 meeting of the NYSBS I was awarded (in absentia) the Herman Bressler Distinguished Service Award for my efforts in behalf of the NYSBS. 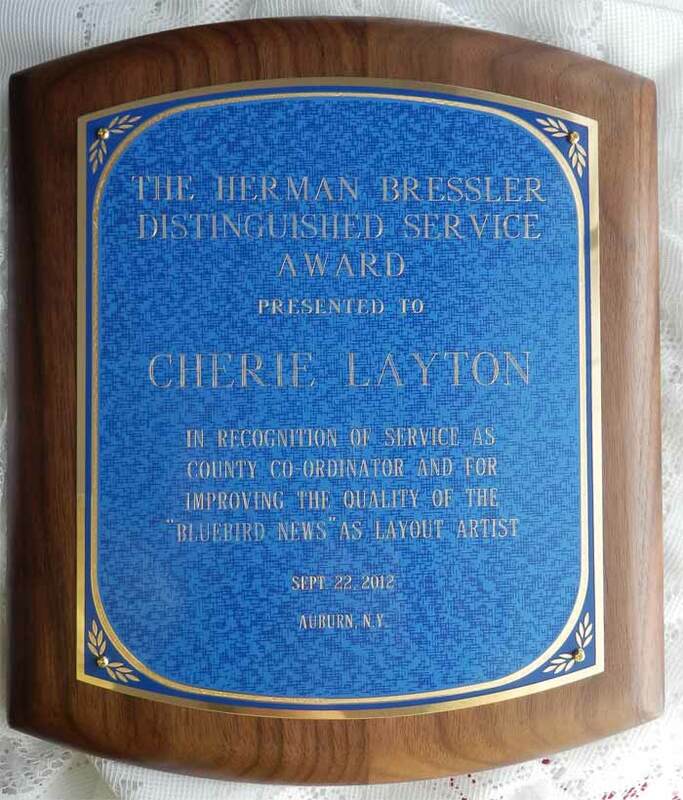 Many thanks to the Awards Committee for this honor! I live in Cayuga County with my husband of 40 years, and my two grown children. They all share my affection for the birds that inhabit our backyard habitat every year. I will be adding photos to subsequent Photo pages – from my own collection, and those of others.